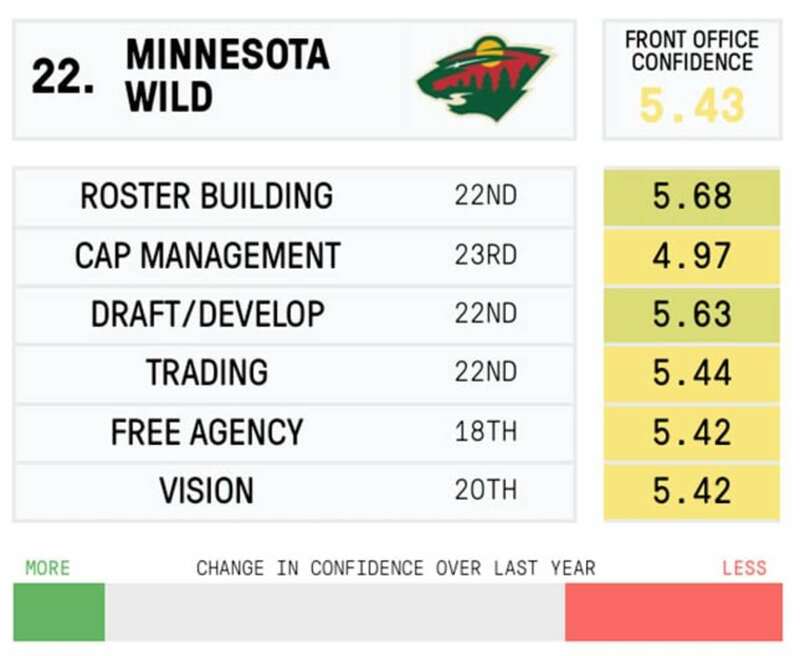 We created a survey asking people to rank each team’s front office in six different categories. The results are in, and Canucks fans are not happy. mega deals that were signed right after, I was curious to see what the consensus opinion was for each team’s front office. I created a survey asking people to rank each team’s front office in six different categories based on how confident they would be if that front office was running their team instead. The categories in question are roster building, cap management, drafting and development, trading, free agency, and vision. The overall ranking was then weighted by how important respondents deemed each skill to be relative to the others. Those surveyed viewed drafting and development as most important, followed by roster building and vision, then cap management, then trading, with free agency seen as the least important. They were also asked if they were more, less or similarly confident with this team based on their moves over the last year or so. Just over 200 people responded to the survey. 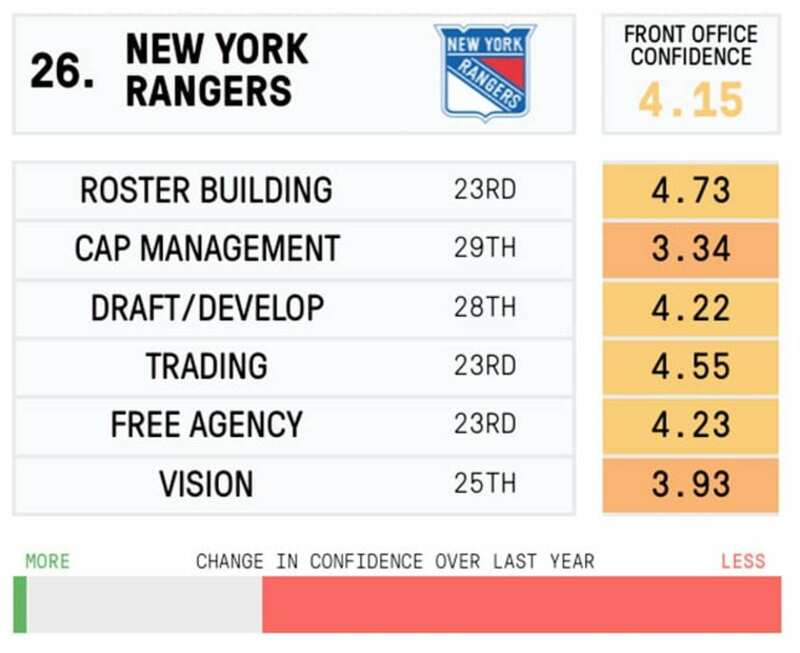 Here’s how much confidence they have with every team on a scale from 1-to-10. It wasn’t even close. Dead last in five of six categories and second last in the other. The Jim Benning era has been the highest form of entertainment for every fanbase outside of Vancouver and an occasional gift giving event for some teams. The team is lost, with zero direction. They’re one of the league’s worst teams and somehow find themselves close to the salary cap. They’ve made a habit of losing every trade they’ve made recently. They’ve signed questionable deals meant to make them competitive when it’s clear to just about everyone else they’re anything but. 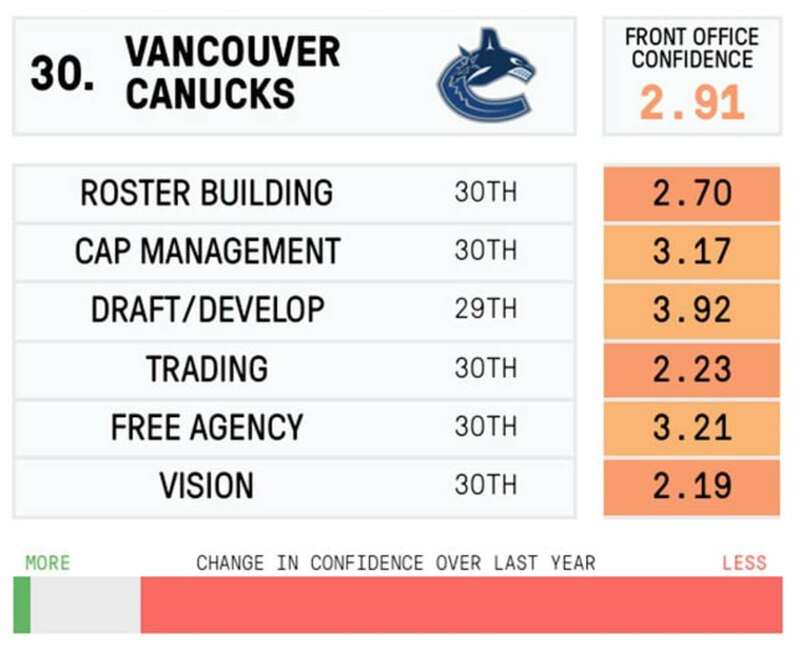 There is simply no reason to be confident in what the Vancouver Canucks are doing right now. 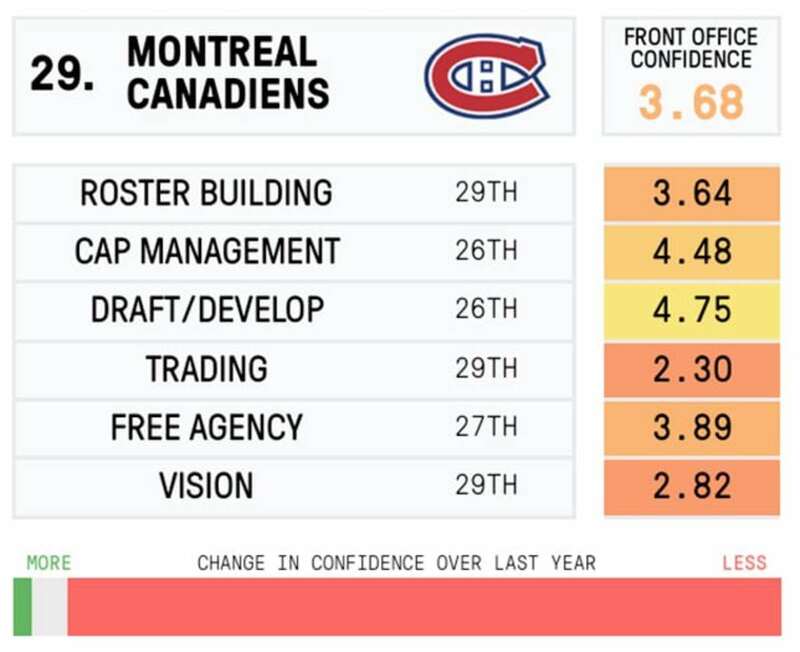 Until recently, I’d have pegged the Canadiens management team as average to maybe even above average. Not anymore, and it seems a lot of people agree with that notion as 93 percent are less confident now than they used to be, the most of any team. Part of that is because the team used to be held in higher regard. The other part is that they completely destroyed any good will by trading a younger, better face-of-the-franchise D-man in exchange for an aging one with a hefty and lengthy contract. How can you really trust this team after that? 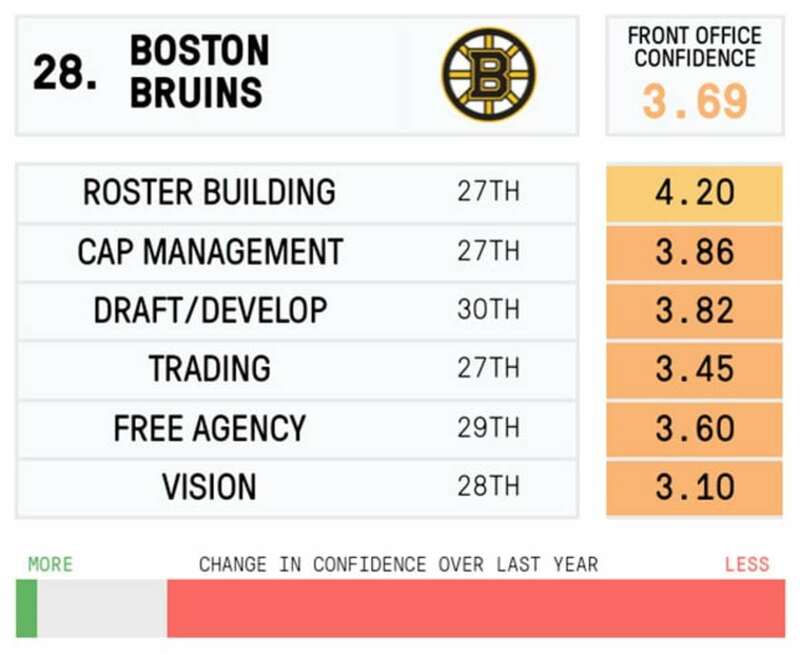 The Don Sweeney era has been tumultuous to say the least – 80 percent of people are less confident than they were a year ago – and it has a lot to do with a flawed vision of the team. It’s a rekindling of the ‘big, bad, Bruins’ as opposed to an emphasis on skill. That’s the issue on the backend at least where the team is mostly just big and bad. Then there’s last year’s draft where people still fondly remember that the Bruins passed on Mathew Barzal and Kyle Connor three straight times while reaching on off-the-board picks. There are very few words to describe how bad the Taylor Hall trade was, so it’s no surprise the team is the 28th ranked for trading. Actually, it’s a surprise they weren’t ranked lower. 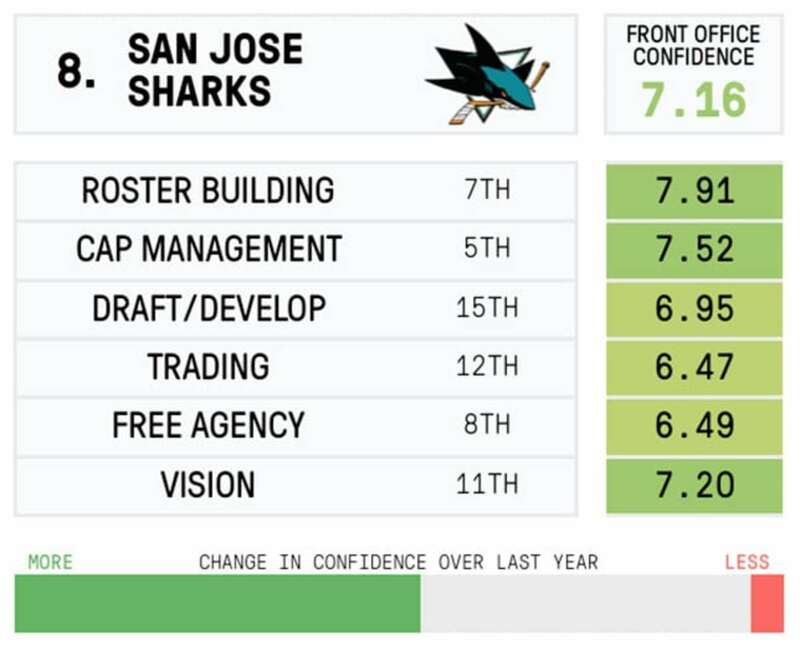 What is surprising is that 12.4 percent of people have gained confidence in this management group over the last year. Was it that bad before that the group that traded Taylor Hall for Adam Larsson is better in comparison? The team’s highest paid defensemen are Marc Staal and Dan Girardi, both of whom make $5.5 million plus per season for four more years, neither of whom deserve that kind of cash. It meant letting go of Keith Yandle, a player the team paid a very high price to acquire that was very under-utilized during his time in New York. I’m not sure what the game plan is in New York, but the future looks dim. 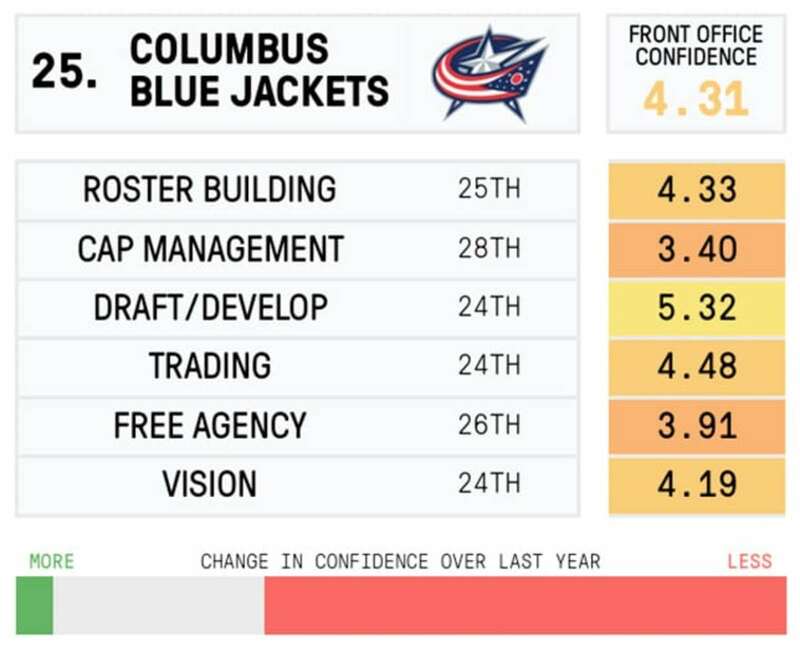 A team that finished fourth last being in cap bind shouldn’t happen, but welcome to Columbus. They’ve got just over $4.5 million in space meaning they don’t have room to add to what is a pretty terrible roster. The team is paying Brandon Dubinsky, Nick Foligno, David Clarkson and Scott Hartnell a combined $21.35 million. 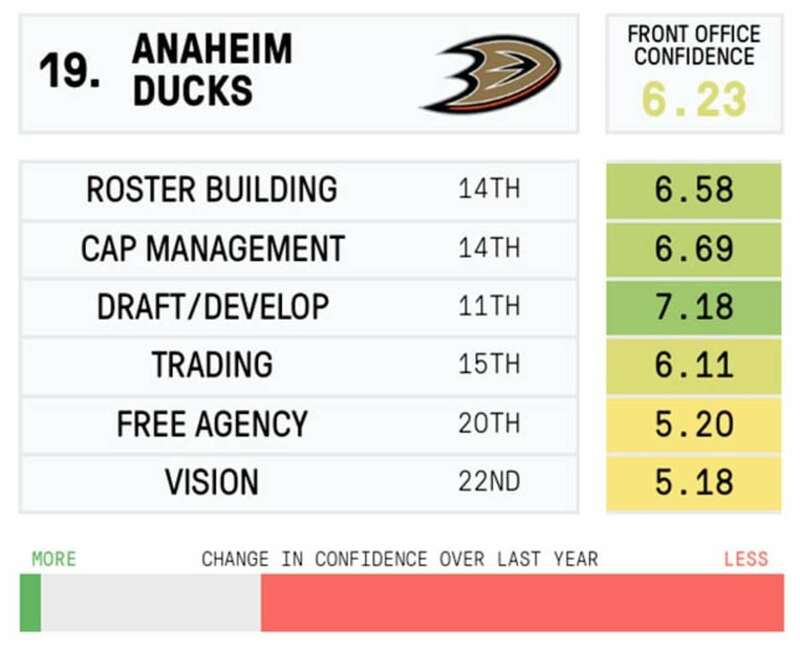 We’ve now reached the point of the rankings where the majority of people aren’t confident with what the team is doing. 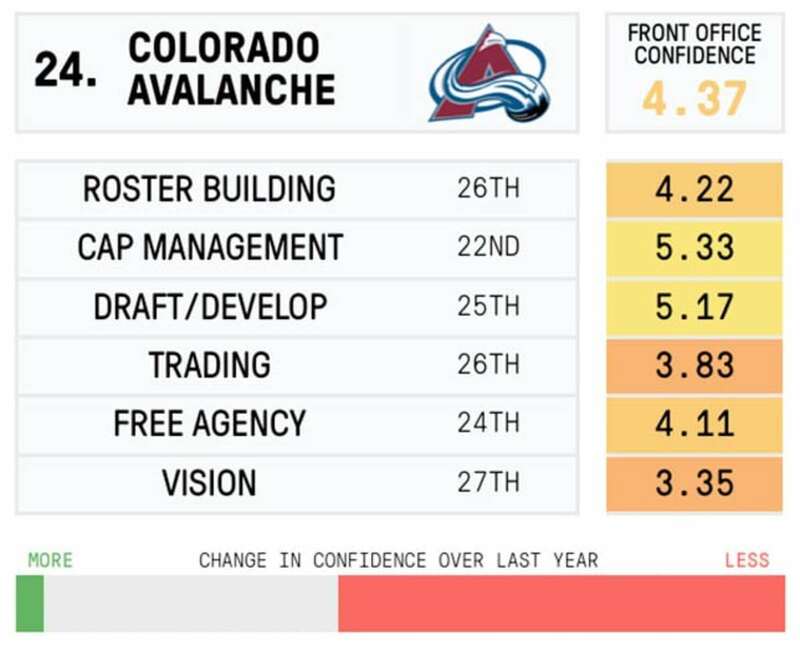 For the Avalanche, it’s their vision that’s the most troubling as people don’t really see what they’re trying to accomplish. They’ve lost Paul Stastny and Ryan O’Reilly in recent years and didn’t get much in the way of a return and there’s persistent rumours about all their talented young players being in play. Not a great look for a team that’s had a lot of trouble building around them. They save a lot of money, sure, but the on-ice product they’ve been putting out has been less than stellar. 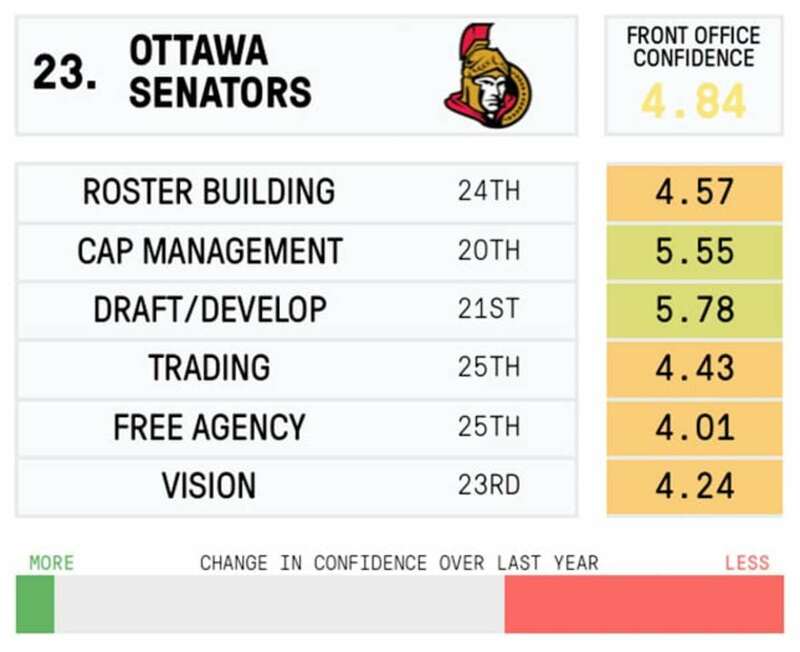 They’ve got a generational talent on the backend in Erik Karlsson and haven’t done nearly enough to surround him with good players that can help out. They’re not very active at doing so either, and when they are it doesn’t usually work out great. Case in point, the Dion Phaneuf trade. I’m not sure what to make of the team’s front office because they haven’t done anything too offensive lately, but they haven’t really wowed either. A team stuck in a cycle of mediocrity. 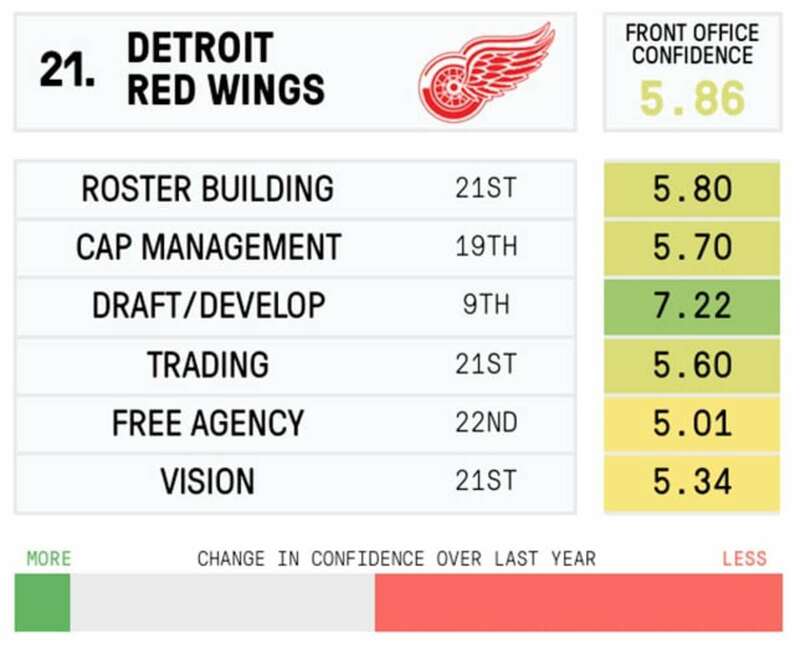 The Red Wings were once the best front office in the NHL running the best team in the NHL. It’s hard not to see that’s all in the past though. People still have faith in their ability to find hidden gems at the draft, but not much else. The team has done a lot of work to try and keep their playoff streak alive, but it’s likely hurting the team long term as they seem content with one round of playoff hockey per year. Perennially one of the league’s best teams, a team with two recent Cups, and yet people think this is bottom tier front office. It’s clear they can build a talented roster, but they also make odd trades like acquiring Rob Scuderi last season. They also pay far too much for loyalty putting them in a cap crunch. Dustin Brown is a 31-year-old third liner making $5.875 million for the next six years. They’ve drafted a lot of great players recently and have one of the league’s deepest D-cores as a result, but the team went off the deep-end after another playoff exit and it’s hard not to see why confidence has dropped. Firing Bruce Boudreau and replacing him with Randy Carlyle is not a move that inspires belief in any team’s process. 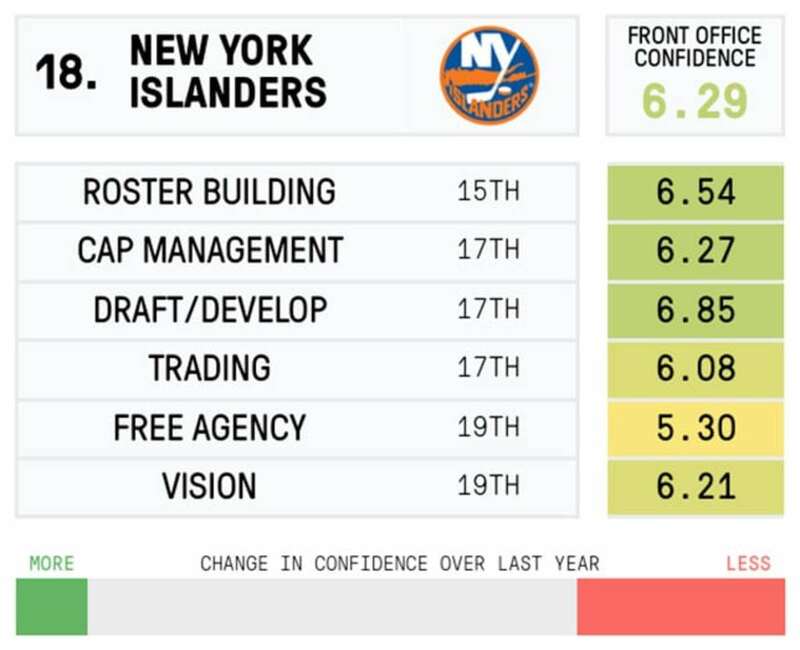 There used to be a lot more hope in what Garth Snow’s group was building, but that seems to have changed. The Nick Leddy and Johnny Boychuk trades were what kickstarted the team toward the playoffs, but now it seems they’ve stalled a bit toward making it over the next step. That Andrew Ladd deal probably doesn’t age well either. Somehow traded Adam Larsson for Taylor Hall. Straight up. Enough said. The Flyers front office might as well be a phoenix. 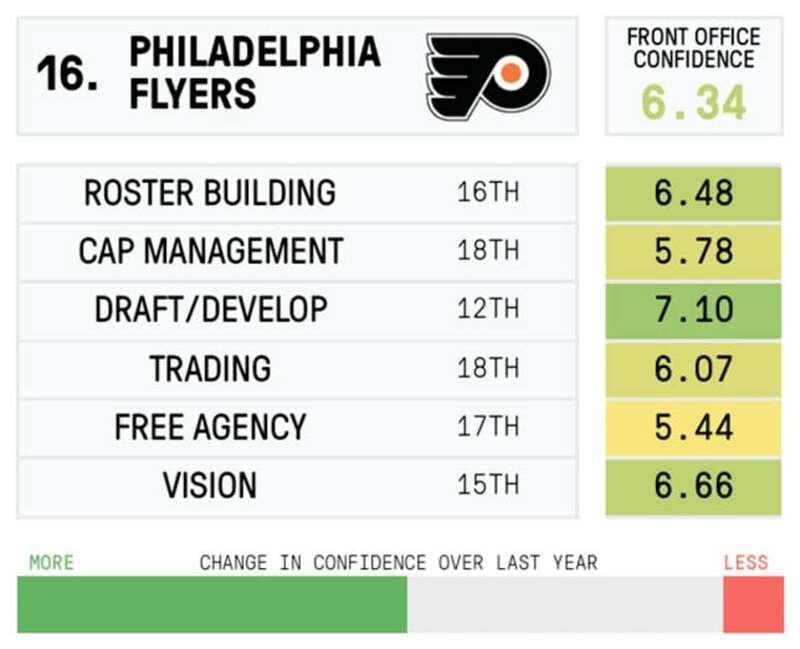 The new regime led by Ron Hextall has risen from the ashes of one of the worst run professional hockey teams over the last few years to become one of the savvier ones. Hextall has made some sneaky good moves making a lot of the roster garbage disappear and has focused a lot more on drafting and developing. They’ve got a solid core group, and have made some very smart decisions of late. 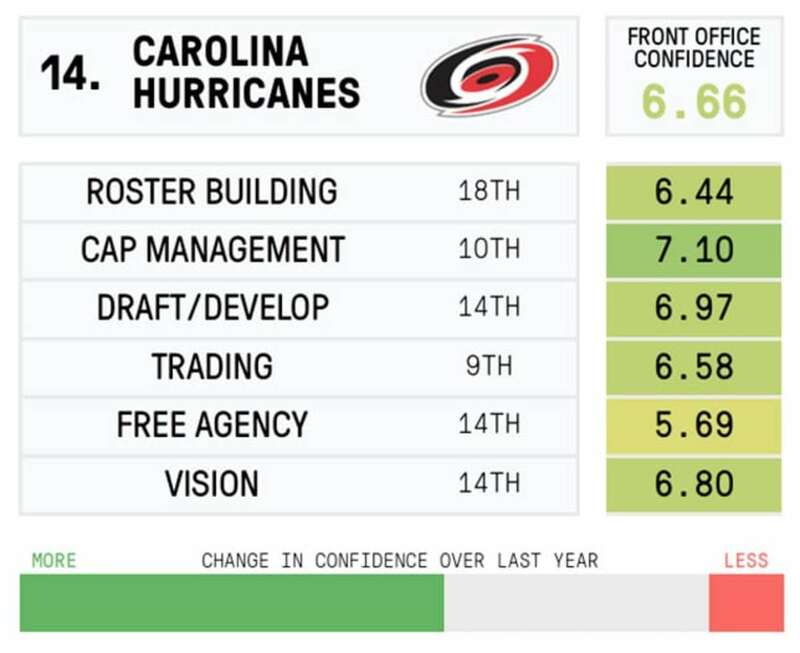 Average across the board, although the memories of the Dougie Hamilton trade coup push that category close to the top third of the league. 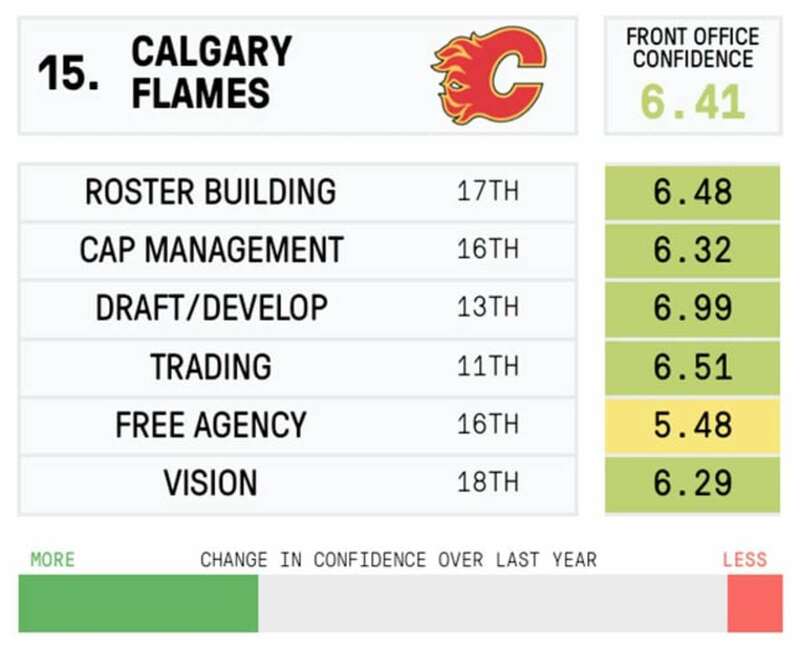 People have become more confident in what Calgary is building, but there’s still a lot of work to be done to make them a top tier front office. It’s a toss up. They practically stole Teuvo Teravainen away from the Blackhawks, but they also re-signed Cam Ward despite being one of the worst goalies in the league over the last few years. They’ve made some great moves recently and are slowly building up toward something good, but it’s difficult to see if they’ll ever be more than just that. 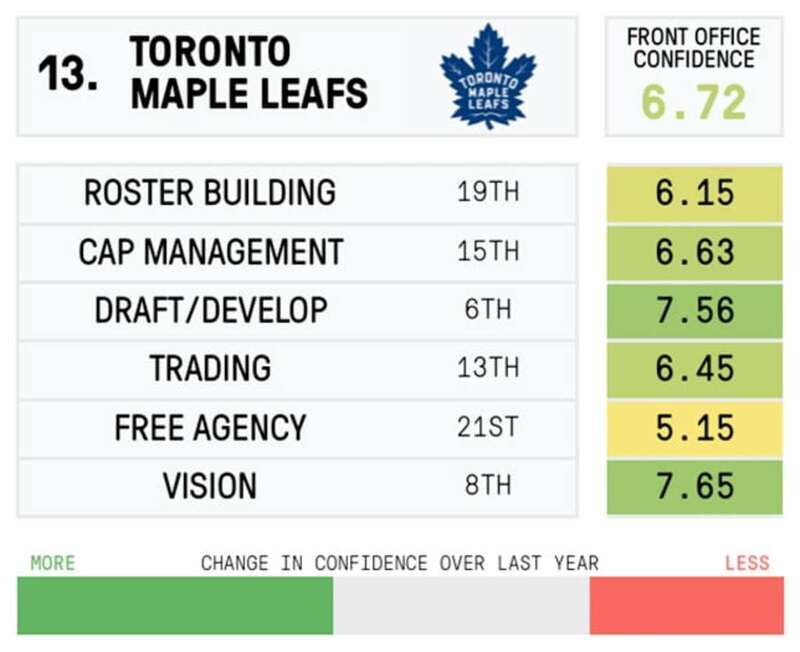 The widest variation for recent confidence as it doesn’t seem like anyone knows how to feel about the Leafs anymore. The Shanaplan started off with a bang, but recent moves have been puzzling to say the least. This team has a big vision, but it’s hard not to think that there might be too many chefs in the kitchen over in Toronto. It’ll be fascinating to see how that all plays out. 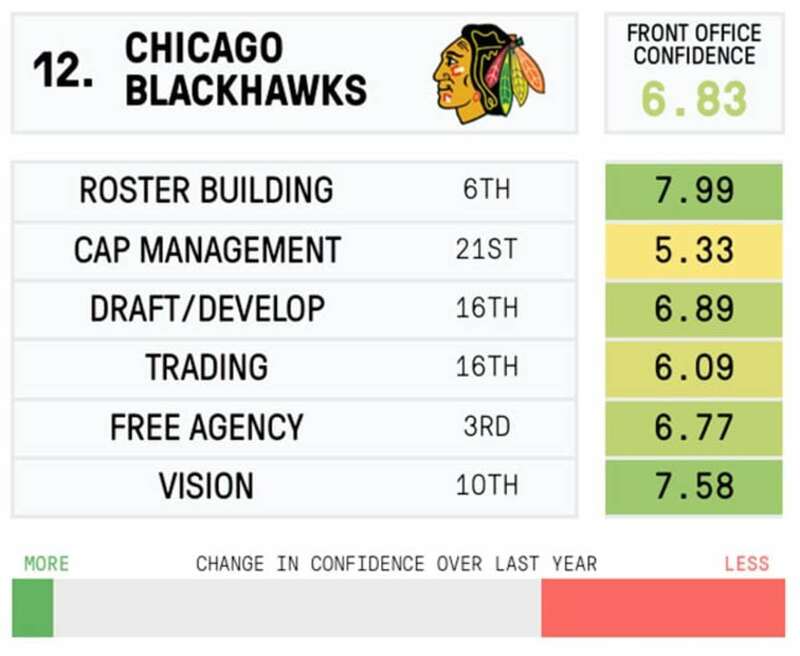 A few years ago Chicago would’ve been at the top of this ranking, but some recent moves have been curious and the team has faded a bit after being pillaged again by the salary cap. They’ve been in cap hell for years now, and while that’s the price to pay for championships, it’s led to some cap management issues and some bad trades. It’s also led to some free agency steals thanks to the prestigious lure of the team. 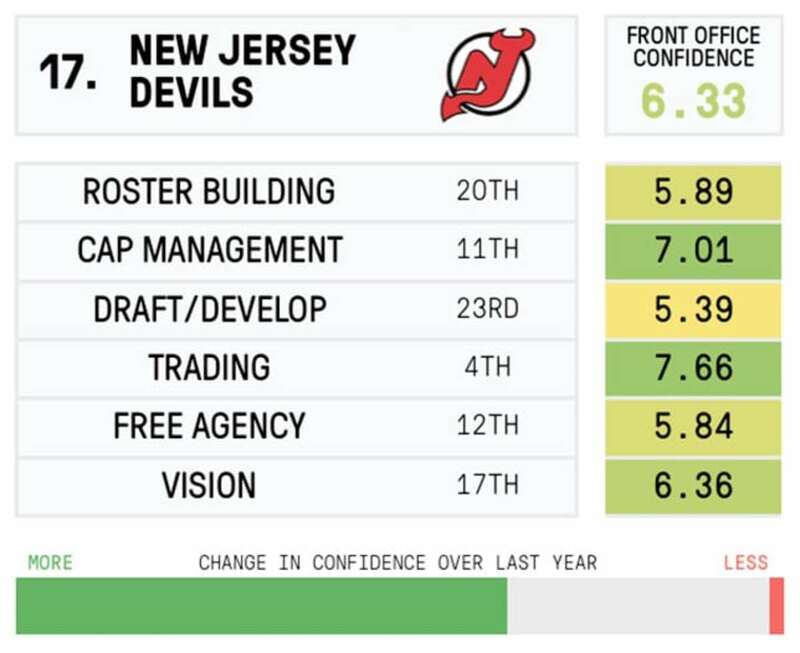 (Yes, the third best free agency team is only rated 6.77 – that’s how little confidence most people have in free agency). The team is likely on the downswing now. Sometimes the best moves are the ones you don’t make. The Blues may have lost David Backes and Troy Brouwer to free agency, but it was absolutely the right move. Too much money and term to two guys who are getting up in age and body miles. The Blues have some talented guys on the come-up so the loss won’t hurt too much as they can fill from within. 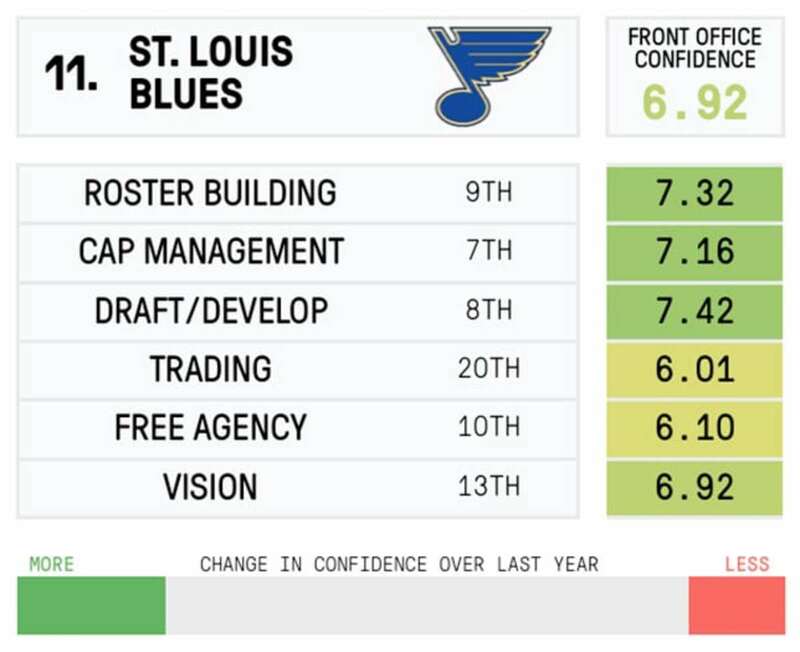 You gotta know when to fold ’em, and that’s exactly what the Blues did at free agency. 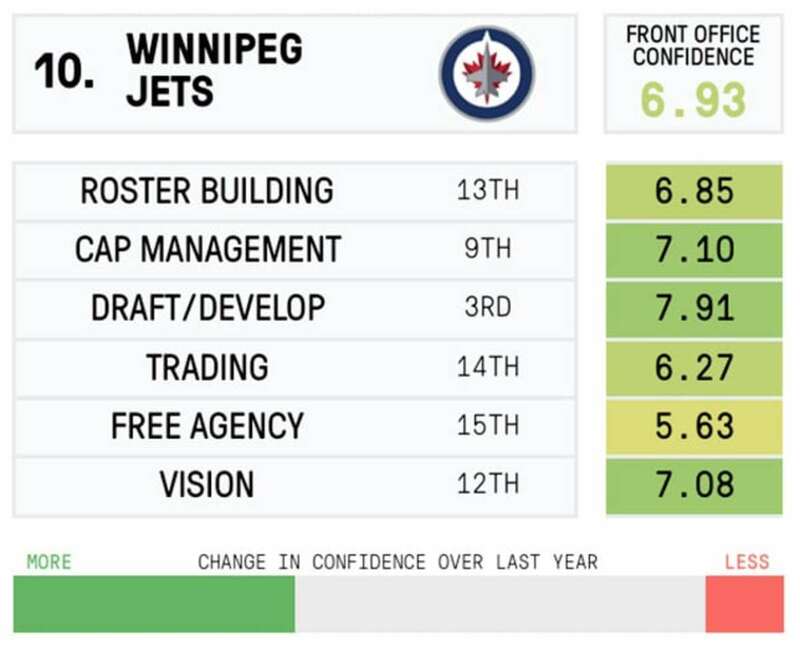 The Jets are an average team when it comes to trading, free agents and roster building, but they find themselves in the top 10 thanks to their farm system. The cupboards are full of talent and they just added Patrik Laine, too. Draft and development takes a lot of patience, but it’s the most important skill here and Winnipeg is nailing it. 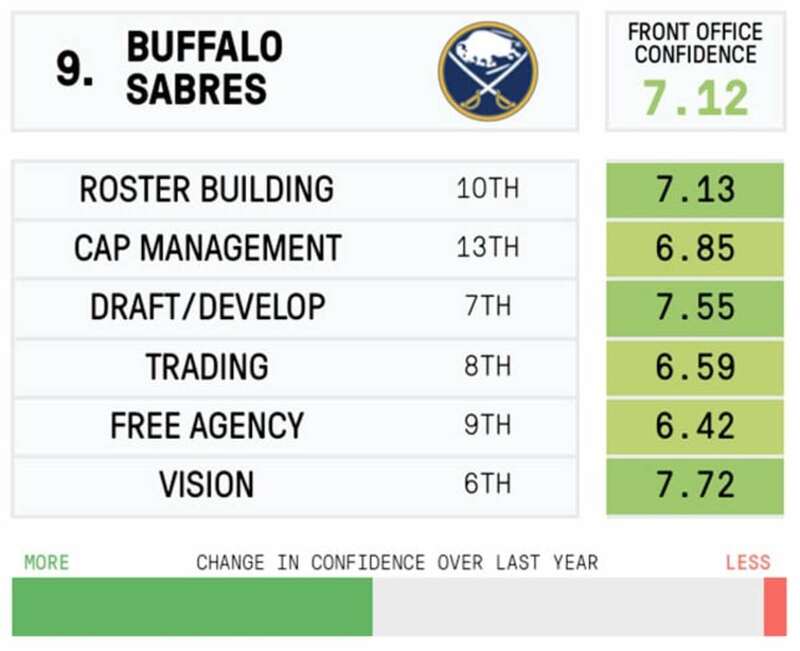 No team has been as spectacularly bad as the Sabres have been over the past few years and it takes a master architect of destruction to get those results. The biggest strength of this front office is its vision for what it takes to build a winning franchise. Now they’ve got Sam Reinhart, Jack Eichel and Alex Nylander in consecutive drafts to show for it. It was painful, but it’ll be worth it in the long run. Had we done this survey two seasons ago the results might’ve been astronomically different. 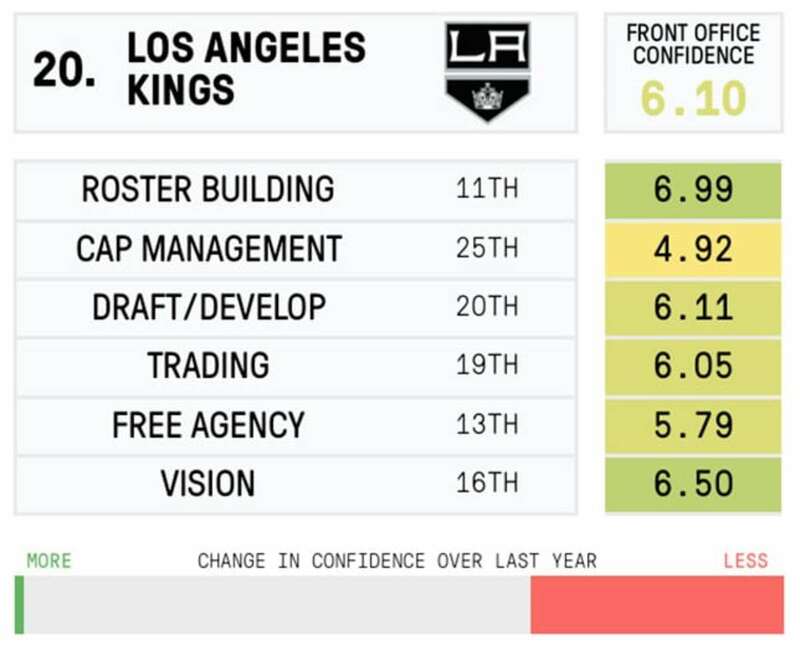 The team was a mess after a historic playoff meltdown to the Kings, but it seems like those days are in the past for this regime. A trip to the Stanley Cup final has renewed optimism for the team and what they’ve built. The number one team for Future Watch has a lot of cap space and a lush prospect pool with a strong vision. 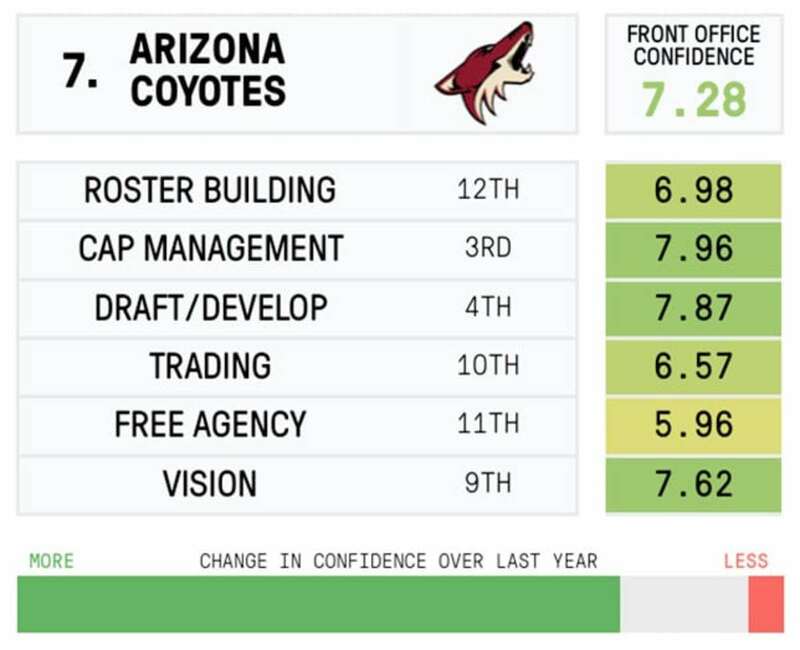 Newly appointed GM John Chayka may not have the experience his contemporaries have, but he brings a fresh new approach to the game that could help the Coyotes build a Cup contender. It’ll be a long road, but most people are pretty confident this is the right group to lead them there. 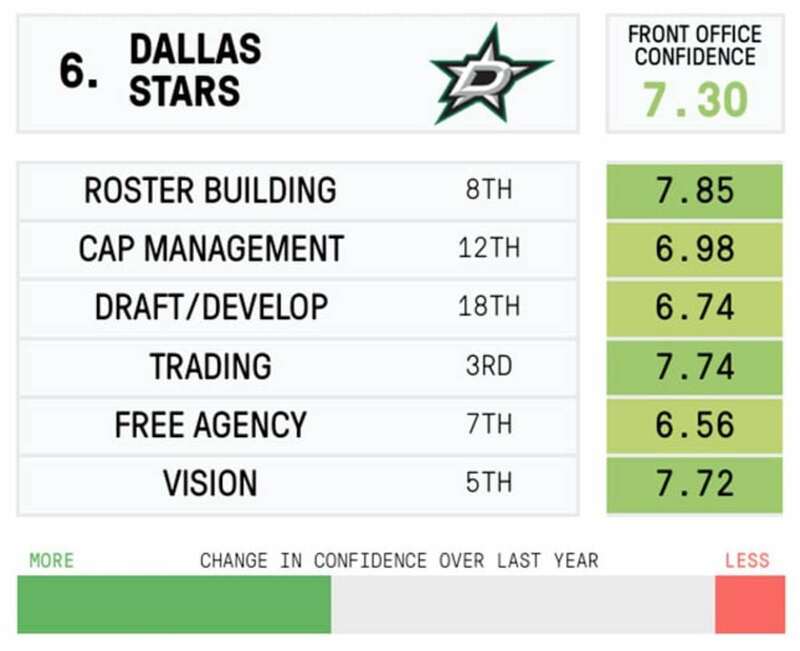 Jim Nill is pretty much the reigning off-season champion so it’s no surprise Dallas ranks highly here. Dallas was thin at center and basically turned a handful of magic beans into Tyler Seguin and Jason Spezza. They did the same thing when acquiring Patrick Sharp, too. There’s been some miscues here and there, but the decision-making process has been mostly on point and it’s why they’re making a push towards the West elite. 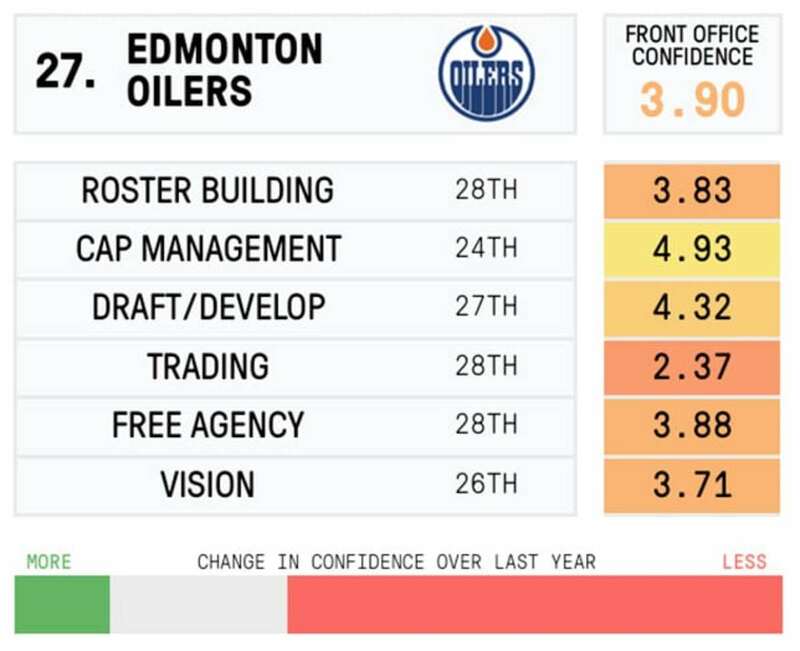 Not a big change in their confidence from last year, but still very positive. 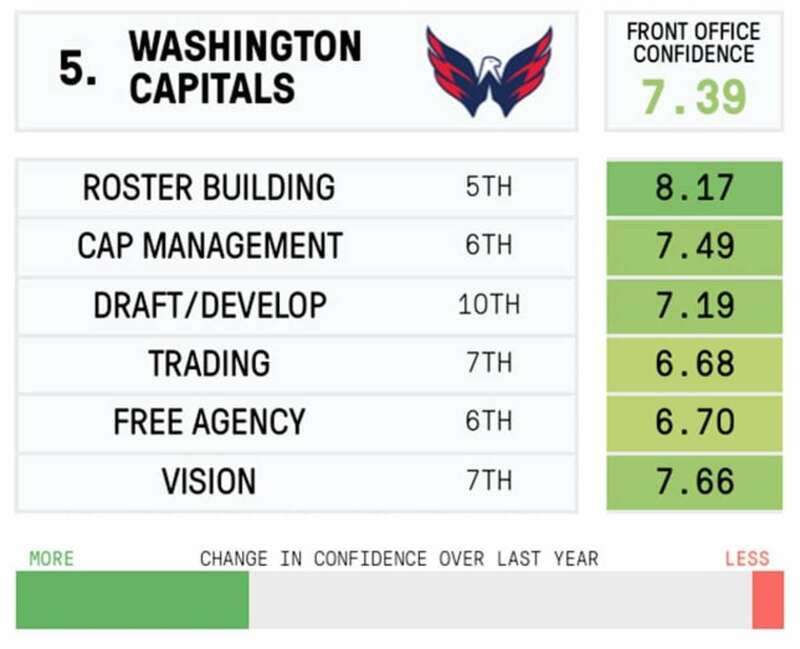 The Capitals have built a very good roster and have done so by setting goals and meeting them. They said they needed ‘D,’ so they signed Matt Niskanen and Brooks Orpik. They said they needed top-six right wing help, so they traded for T.J. Oshie and signed Justin Williams. They haven’t won in the Ovie era yet, but they’ve gotten closer and this management group is a good reason why. The best way to gain management trust? Just win, baby. 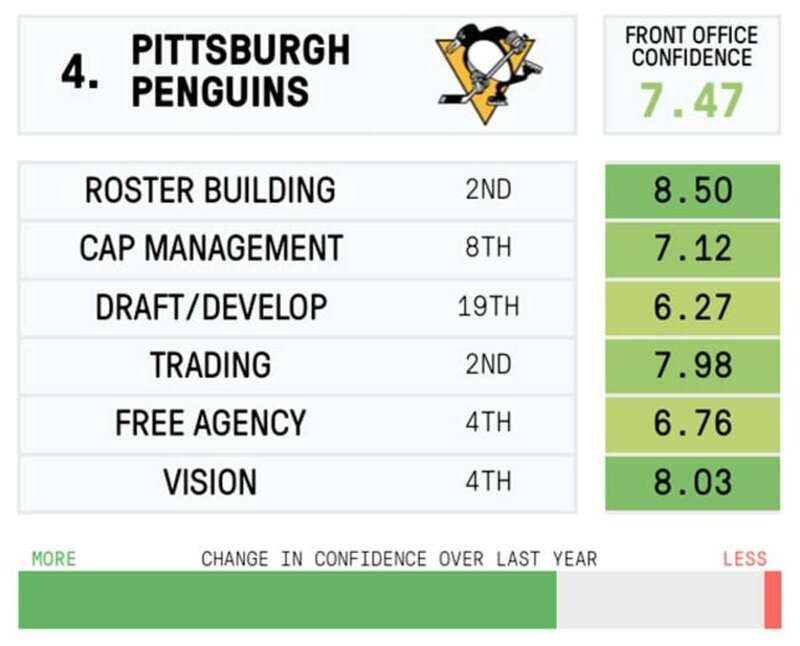 The Pens did just that this offseason and it was specifically thanks to moves they made beforehand. The HBK line that ran roughshod through every team it faced in the playoffs was acquired entirely through trade. The team’s issue was always surrounding its two franchise centers with talent, but that’s no longer a problem. Another team with a big boost in confidence and all it took was one simple trade. The team added a number one center and D-man in the span of a few months and got rid of a truly harrowing contract in the process. 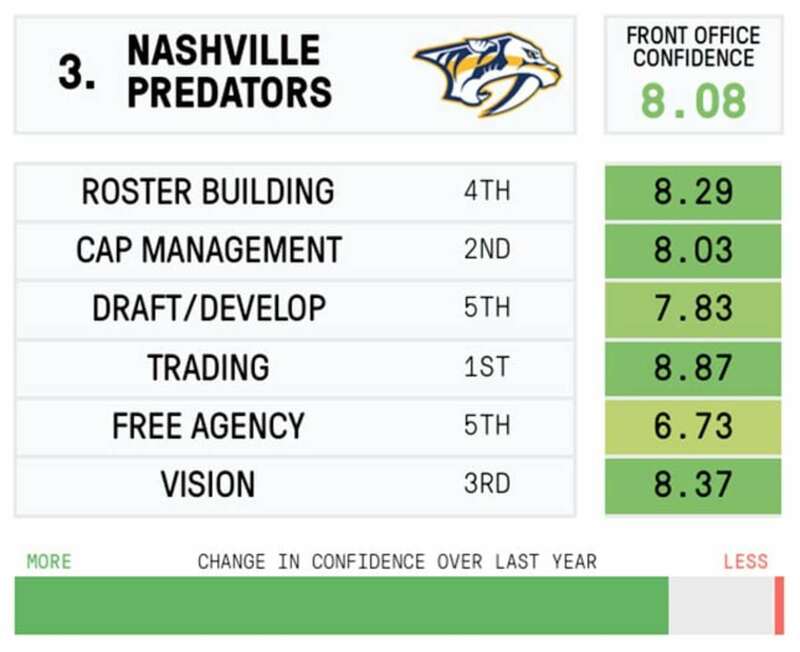 The Preds have arguably one of the best top four defense groups in the league and the overall cost of it is under $20 million. Talk about cap management. A lot of love for South Florida apparently. No team has seen a higher jump in confidence than the Panthers as 90 percent of respondents say they’re more confident now than they were a year ago. The team has signed a lot of big money deals lately that were seen as good value and they’ve built a very competitive roster from stacking up their D-core through free agency. Definitely a team to watch going forward. 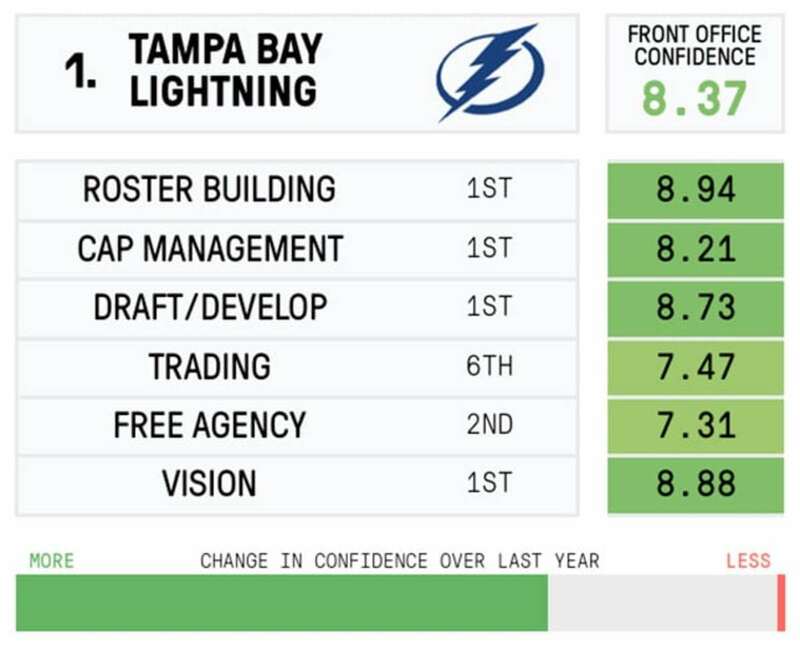 The top team in four different categories, it seems like people really believe in what the Lightning are doing. 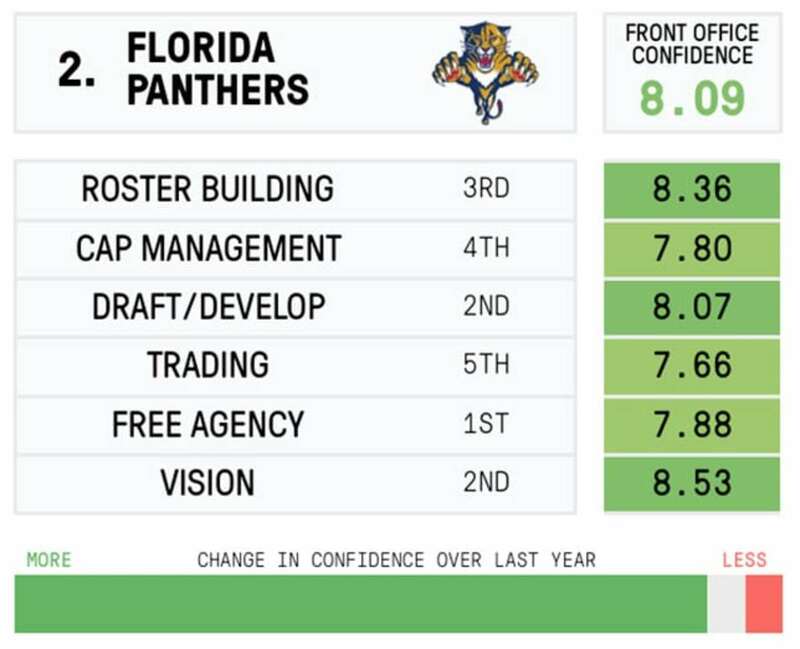 They even gave them an extreme vote of confidence in cap management despite the contracts handed out to Ryan Callahan, Matt Carle (who was bought out) and Jason Garrison. The recent sweetheart deals signed by Steven Stamkos and Victor Hedman likely played a role in that. This team is built to win soon and often. Dom Luszczyszyn is a freelancer for The Hockey News. His passion for the game stems from his father, who enjoys yelling at the TV while watching. Dom has strong opinions on your favorite team based on numbers – and numbers only – because he doesn't watch the games, just his spreadsheets.